What can you learn from a food truck? The menu and penny prices. In Parker’s preK 3 class, what the students grow curious about in play becomes their lesson. Recently, students began making “food” in their playground “mud kitchen.” As their teachers, Leigh Augustine and Sarah Penge, began to engage them in conversation about their play, lots of experiences with food cropped up. Students talked about places where they ate outdoors, like at the farmer’s market. That triggered a memory and an explanation in another student about visiting food trucks. With that, suddenly a project was launched. 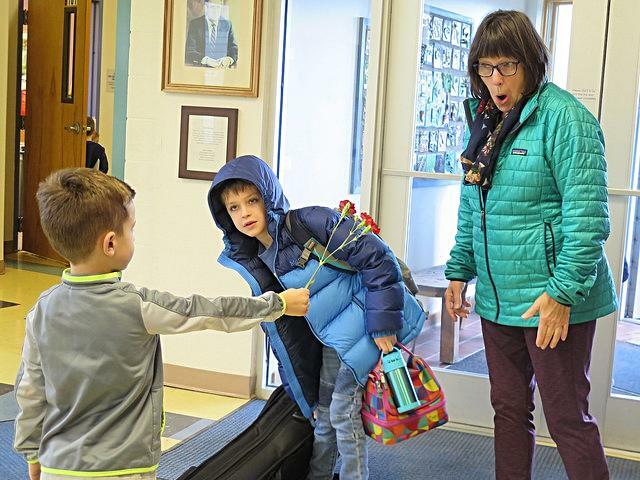 Creative and responsive teachers take ideas and propel them into projects. 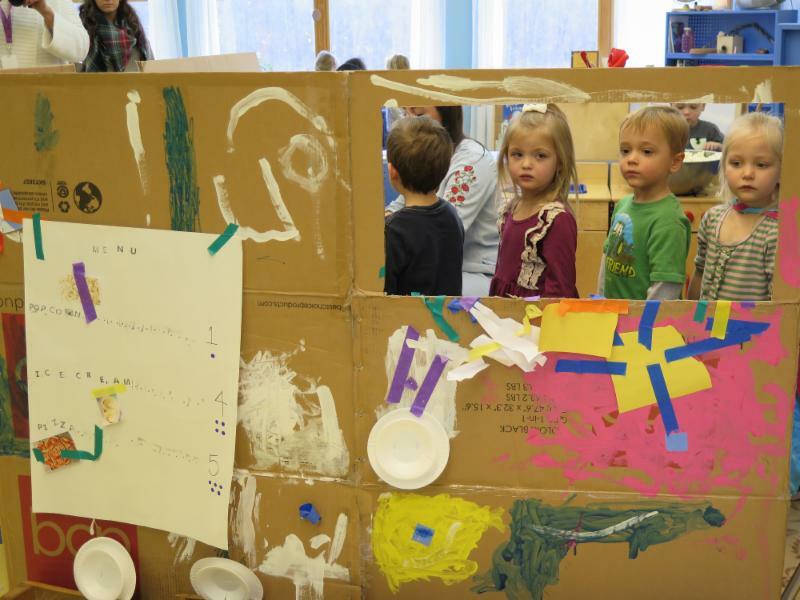 The three year-olds were led to realize that to make their own food truck, they would need to design a menu, prepare the food, set prices, and naturally, build a truck. The menu preparation was a lesson in science and math. 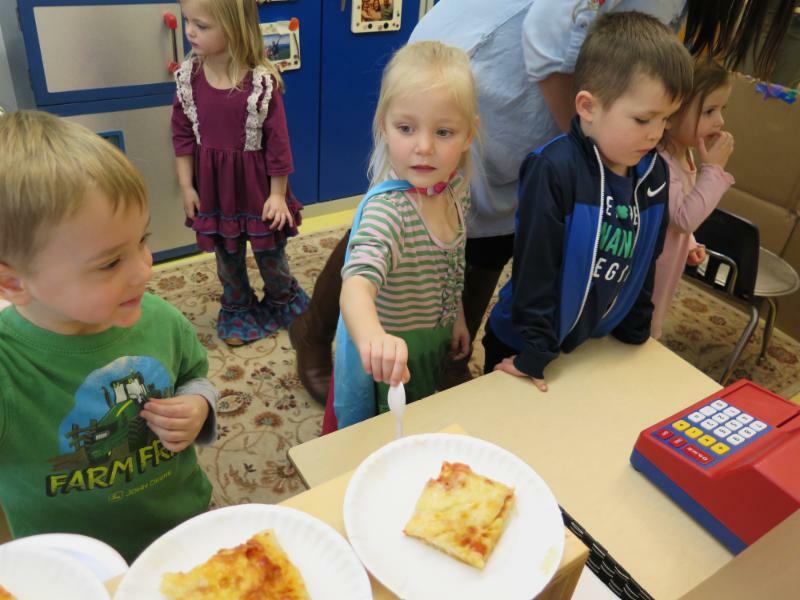 The students selected pizza, popcorn and ice cream as products. These items involved having the ingredients change form– under heat or under cold. Pizza involved changes to the shape of the ingredients, layering and ordering, and dividing shapes into portions. Large cardboard was fashioned into the truck and the kitchen area of the classroom was transformed into the interior. 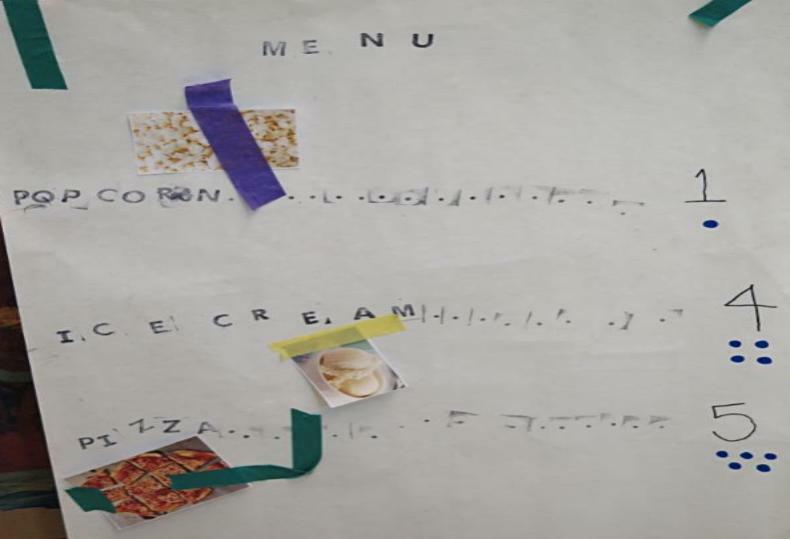 Students printed a menu using alphabet stamps, a lesson in letter recognition. Selling the menu was the last challenge. Teachers, administrators, 4-5 buddies K-1 neighbors and the preK 4 class were invited to be the customers. The students practiced commerce using the currency of sea shells, but in real life, the customers used pennies. You have to be focused, careful and have good customer relations as visitors arrive to be served! What can you learn from a food truck? Perhaps that is not the question. What can you learn by creating a food truck? So much! 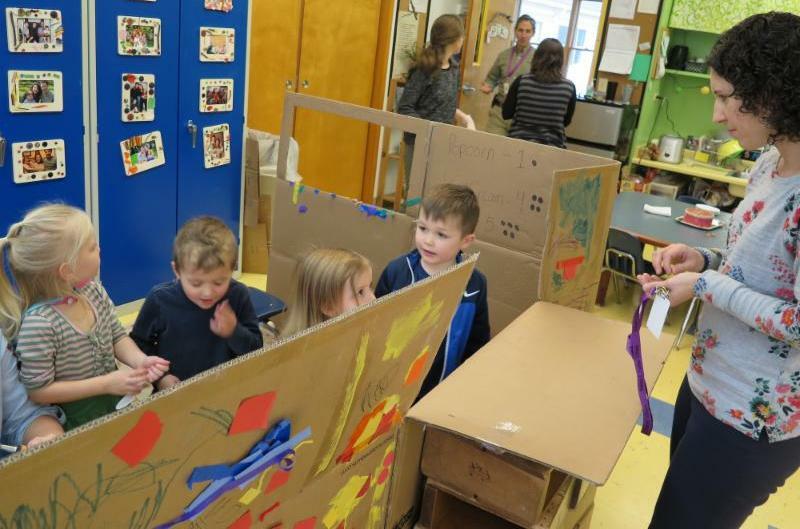 Our preK 3 class of active learners experienced making, creating, and then presenting their project– an authentic experience. The teachers designed layers learning– starting with what the students already knew– and build lessons the connect to education goals in a fun, playful, and yes, delicious way! BusinessManager, Michele, places her order. 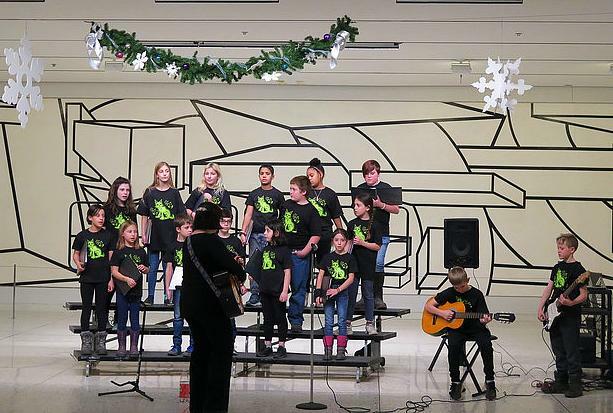 The Parker Chorus, under the direction of music teacher Sara Feltes, had its first of two winter tour performances this week. The singers, in grades 3-8 sang for an hour to entertain the crowds in the Empire State Plaza Concourse during lunch hour. The music selections had winter and peace themes. Some songs were preceded by students reading poetry, while others were accompanied by student musicians. Our chorus is the youngest group of singers to be performing in the concourse this holiday season. The chorus has a second appearance scheduled for 4:30pm on Wednesday, December 11 at Colonie Center. Come if you can! 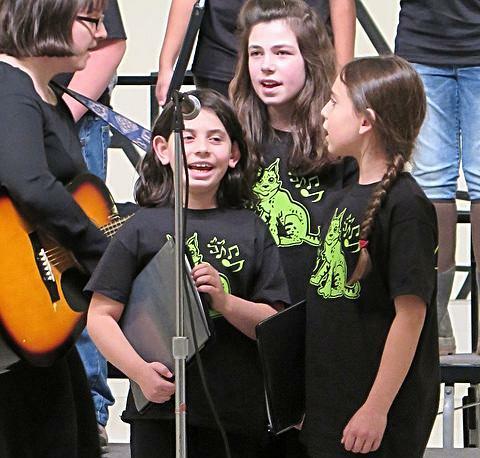 For their performances, Parker’s chorus wears t-shirts with our mascot, the “Bobcat” printed on them. The Bobcat is in honor Robert C. Parker. Eighth grader Madeline has been working for the good of others each December since she was seven years old. She can barely remember how it began, first being inspired by a story of a kid with a lemonade stand who raised money for a cause. She began to talk with her mom about running a lemonade stand. Her mom gently counseled that lemonade would not be a big seller in upstate New York in December. So, undaunted, Madeline gave the matter some thought, and decided to bake and sell goodies. Where to have the bake sale? 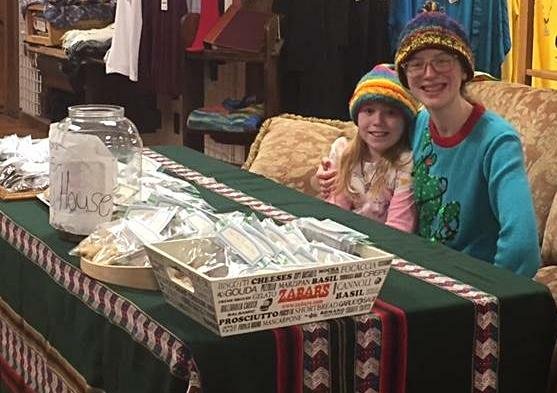 She liked the store The Sweater Venture in East Greenbush, so her mom drove her there where she strode inside and pitched her idea. The store is cozy, not corporate, and the owners agreed to the idea. Six years later, “Madeline’s Bake Sale at the Sweater Venture” is still going strong. Early on, Madeline chose Unity House, in Troy, as the beneficiary of her proceeds. “I wanted to help lots of different types of people, and they have a lot of programs,” she explained. Over the years, she has targeted the funds raised to help buy toys for children whose families can’t afford them. “I think if the children in a household are happy playing with toys, that would make it so much better for the parents,” she said. Each year the bake sale has grown. In its first year, the sale raised a little more than $100. This year, Madeline brought Unity House a gift of $1100. The owners of The Sweater Venture have given her tips and customer engagement ideas all along. And, each year, some supporters visit the store just to support Madeline’s project. Her snickerdoodles have a particular following. Hats off to this project: for its compassion, its entrepreneurship, and its ongoing dedication to being of service! Before he even fell asleep at the end of the day after last week’s special visitor, a kindergartner had already planned how he would use his $20. “I want to give out flowers to make people smile!” he announced to his family. So, on Monday morning, he arrived with a vase, and offered flowers to adults and children arriving for the day. Yes, he made people smile.